When I started analyzing it, I learned quickly that the same four chords are repeated through in the same order through out the piece. There is a slight exception, however. The second time the E minor is played, it has a C in the bass, which makes it a C major 7. Thus I’ve arranged it with different patterns every eight bars, allowing my students to choose a section they are comfortable with and repeat that section over and over again. 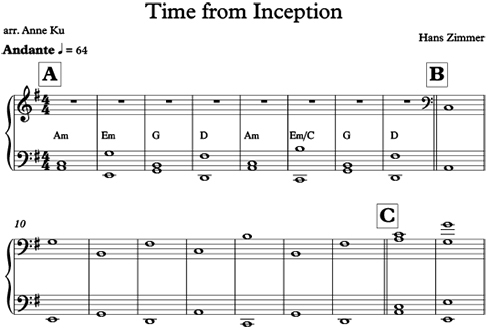 Time by Hans Zimmer is an example of minimalist music. Minimalism is a technique of music where you use few elements. As a result, it takes a long time to show change. Such music uses a lot of repetition. Keeping to time is critical. In this piece of music, we start low, soft, and few (notes) and gradually expand from closed to open chords, up the register, louder and louder, layer upon layer, thicker and thicker. We then add additional patterns in between the outer bounds of bass and melody. At some point we retreat. This is a cool piece to introduce the class to minimalism. On Sunday February 22, 2015 my new instrumental piano class performed this piece on the last day of the Maui Open Studio 2015. The video below was made by artist Carolyn Quan, founder of this annual event.